REDLANDS, Calif., Sept. 15, 2017 /PRNewswire/ -- Climet Instruments Company, a division of Venturedyne Ltd. (www.climet.com), the leading manufacturer of high-quality cleanroom particle counters and microbial samplers, today announced the introduction of their NextGen portable particle counter, the CI-x70 Series. This NextGen model compliments Climet's current CI-x5x Series of portable particle counters. The CI-x70 NextGen particle counter is the smallest and lightest pharmaceutical/industrial grade portable particle counter on the market today. The design is extremely rugged, having been successfully calibrated after being both drop and vibration tested. The CI-x70 Series introduces many new options not available in previous generations and includes several innovations not available elsewhere. It comes standard with six-channels, and varies by flow rate (1 CFM, 50 LPM, 75 LPM, and 100 LPM). New features include a capacitive touch screen, similar to smart devices allowing users to pinch-to-zoom and swipe-to-scroll. This is of particular benefit when reviewing pdf reports (ISO 14644, EU GMP, or FS 209e), which are fully compliant with 21 CFR Part 11. The extremely energy efficient design offers users the longest run time on a single battery confirmation, even when compared to competitors' dual battery design. This offers users substantial savings in consumables and contributes to Climet's unparalleled lowest Total Cost of Ownership (TCO). The new CI-x70 has onboard memory for up to a million or more samples, and factory expandable User ID's, Location ID's, and Programs (default of 100 each). Its unique user-configurable light ring provides for 360-degree viewing, 5-colors, and several alert patterns. The CI-x70 NextGen particle counter has a stainless steel enclosure, is only 9.4 pounds with the battery installed, and is only 587.9 cubic inches in size. Climet's new patent pending (or patented) ultra-quiet / ultra-clean blower technology makes the CI-x70 Series the world's smallest, lightest, quietest, and cleanest portable particle counter on the market. According to Jim Strachan, Climet's General Manager, "The CI-x70 Series incorporates disruptive technology providing not only innovative features and benefits today, but also it provides a platform for future expansion and development." "The CI-x70 NextGen particle counter incorporates the highest quality material, and with over 55 years in business it is designed with the highest level of engineering acumen," says Dave Chandler, Climet's Engineering Manager. "This provides the lowest interval calibration out-of-tolerance rates in the industry, and helps to mitigate user deviation reports and failure investigations." Climet is the only manufacturer of particle counters to both test and certify the HEPA filtered exhaust to ISO Class 3. Climet is currently accepting customer pre-orders and production is slated to begin on or before December 2017. Additional features and enhancement will be announced in the future. 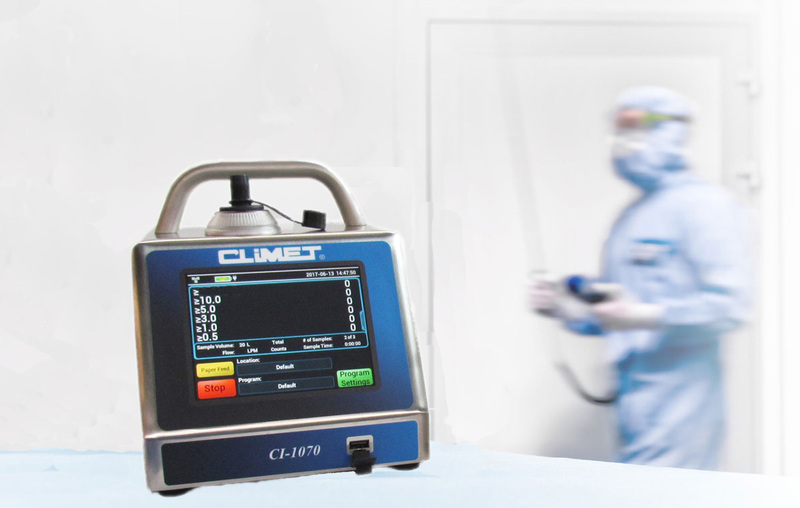 Founded in 1962, Climet is engaged in the manufacture of environmental monitoring equipment for use in cleanroom environments (particle counters and microbial samplers). Differentiated by quality, accuracy, and assurance. Climet offers users unparalleled service, return on investment, and the lowest Cost of Poor Quality (CoPQ) on their environmental monitoring instrumentation.